Just outside the small town of Antonito, in southern Colorado’s sparsely populated San Luis Valley, a highway sign points to the state’s oldest church, a twin-towered sanctuary built of brick and local dark volcanic rock. A bit farther on, the towers of a very different sanctuary rise over a dusty neighborhood on the other side of the road. No highway sign marks this shrine, and none is needed: The aluminum-clad edifices, as tall as church steeples but unlike any ecclesiastical architecture I have ever seen, loom like an apparition. Their reflective skin shimmers in the high desert sunlight, beckoning the curious to the backyard of a tumbledown house at the edge of town. There, across from irrigated fields, rises El Castillo, the castle, a fantastical complex decorated with rows of beer-can ends framing old windows, hubcaps arranged like architectural sequins, and faced with rough native rock and slogan-bearing signs. Bizarre at first glance, the homemade shrine is also oddly charming, very much a part of the small town and its huge landscape. My husband, Richard, and I stopped at the complex one morning on a tour of the San Luis Valley with our friend Glenn. As we pulled up, a wiry figure dressed in a grimy blue nylon jacket introduced himself as Cano ("Like Chicano, you know"). We shook hands. Cano waved us through an arched gate of bent steel rebar and interlaced willow branches under the words "Jesus, Lord of Kings," and into a yard crowded with tools, scrap metal and piles of old lumber. Cano pointed out the features of the shrine: the three-sided nichos he fashioned from discarded bathtubs that shelter plaster statues of Our Lady, Jesus, and the Holy Family, the six-foot-tall cross built of beer cans, the twin towers rising five stories overhead. 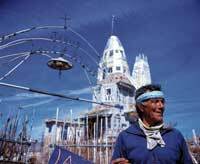 All, said Cano with some pride, were constructed of salvaged materials: scrap lumber, used windows, chromed hubcaps, wooden screens, bottles, and aluminum cans, his signature material. He snips off the ends for decorative studs, then slits each can to make a rectangular aluminum shingle that, when pieced with hundreds of others into a metal quilt, forms the silver "skin" of the towers. Cano’s vision for El Castillo came to him sometime after he returned from Vietnam — locals say the first tower appeared in the early 1980s, the second after the fall of the World Trade Center. The rambling complex is still growing according to an internal plan that Cano maintains is directed by God: "When I need something, I look and there it is." Gesturing at the twin towers that rise some 50 feet above the small yard, Cano said, "Those are ‘The King’ and ‘The Queen.’ " A six-armed cross tops The King’s rounded, missile-nosecone shape. Balconies decorate its lower stories. The Queen’s flat roof sports a widow’s walk; below, vertical lines of glass brick pierce its sloping sides like narrow portholes. Carved wood screens behind the third-story windows lend a Moorish feel. Hand-painted signs dot the shrine: "La Raza and La Tierra," "Vitamin M," and "La Virgen de Guadalupe." Two 10-foot-tall arrows plunging into the ground outside the fence bear the slogans "Alcohol and Tobacco Kills" and "Mary Jane Saves." While Richard listened intently to Cano, Glenn moved about the yard shooting photos. I sat by myself in the thin shade of an apricot tree, my head whirling. Antonito, one of the oldest towns in the San Luis Valley, was colonized in 1849 by Hispanic farm families. It once had a commercial railroad, huge herds of sheep, and a powerful farmer’s union. Today the town ekes out a meager living from a tourist railroad, government offices, and from the remaining small ranches and farms. Cano’s eccentric shrine may draw tourists off the highway, but to many locals El Castillo is — at best — an embarrassment, and its creator, one of the community locos. Stories abound about the man they know as Dominic Espinoza. There was the time when the Olympic flame passed through Antonito, for instance, and Cano grabbed the torch from the shocked runner carrying it. Or the time he was released from jail, walked a few feet, and stole the sheriff’s car for a ride home. There is his penchant for racing the tourist trains on horseback, whooping, in headband and loincloth; and his habit of tethering his horse on the lawn of the town funeral parlor or at the football field for a bit of free grazing. There is his strained relationship with his family, which includes 12 siblings. 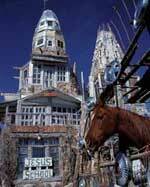 Some say that he evicted his mother from what had been his grandfather’s house in order to build El Castillo. Whoever the man who calls himself Cano is, he is clearly no saint. He admits to drinking and using drugs, although he gave them all up, he says, except for marijuana. He lives on food stamps, cash donations, and whatever he can scavenge or scrounge. Proud one moment as he describes what he has built, sly as he mentions a visitor who snapped his picture and gave him money, Cano’s manner is as much Coyote, the Native American trickster, as hero. Yet he has a hero’s ganas, the drive to follow his vision, no matter the consequences, or how blurred it may sometimes be. He shows a hero’s zeal in his ability to literally build something out of nothing, to not only recognize the value in what others toss away, but to consecrate trash by incorporating it into a shrine. Cano doesn’t call himself a hero — "It is not me building the towers, it is God" — but his creations speak for themselves. What they say depends very much on the perspective of their audience. I am neither Hispanic, Native American, nor Catholic; nor do I live in the San Luis Valley. I am a Quaker of Northern European extraction, born to cautious, reserved people who prefer the order and logic of science over the turbulent and sometimes messy insights of heart and spirit. Yet I understand the persistent urging of visions. The radical acts of political and social disobedience that have sent Quakers to jail or even death come from the promptings of an inner voice that will not be denied. Cano appears to have paid heavily for heeding those inner exhortations. Adhering to the mission of building El Castillo has isolated him from his family and community — even his given name. His journey follows the lonely border between sanity and madness, a distinction that can often only be discerned in hindsight, the same edge that produces profound and visionary art — or work that is simply crazy. We exited the gate of El Castillo and Cano put one arm around Richard: "I love you, man," he said. He extended his other arm to me. As I leaned into the embrace, Cano’s graying curls brushed the top of my head and I inhaled his musky scent, part sweat, part sagebrush smudge. Staring at the silver towers as we drove away, I wondered if I had the guts necessary to walk that edge — and what it would mean if I did. The author writes from Salida, Colorado. This essay is derived from her new book, The San Luis Valley: Sand Dunes and Sandhill Cranes, with photos by Glenn Oakley, published by the University of Arizona Press.